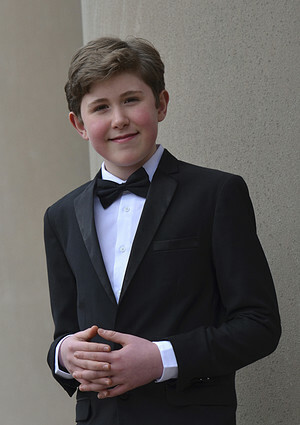 By Peter Tonguette, April 7, 2018, "The Columbus Dispatch"
In 2010, when he was 6 years old, Granville pianist Gavin George took to the stage of Carnegie Hall in New York. Now, as a teenager, the budding musician is establishing himself with the leading orchestras in central Ohio. Last April, George, now 14, made his debut as a soloist with the Columbus Symphony; this weekend, he is playing for the first time with the ProMusica Chamber Orchestra. The performance was the highlight of a program filled with exuberant, ebullient music; scarcely a downbeat note was heard in a concert that served as a perfect start to spring. The program will be repeated at 7 p.m. Sunday. Conductor David Danzmayr opened with the soaring sounds of Igor Stravinsky’s “Pulcinella” (first composed to be paired with a famous ballet). As Danzmayr explained in his opening remarks, Stravinsky borrowed liberally from already extant music — namely, from the baroque era — and “remixed” it. In the “serenata” movement, Danzmayr coaxed sedate, precise playing, but he summoned a burst of energy in the buoyant “scherzino” movement. Throughout, each section of the orchestra excelled, from the warm, busy strings to the majestic brass to the winding winds. “Pulcinella” concluded with a dazzling finale overflowing with boisterous yet beautiful sounds; the orchestra’s sparkling playing is surely exactly what the composer had in mind. George joined the orchestra for the piano concerto by Mozart. The youngster’s technically stellar musicianship added to the gentle, joyful mood of the piece; his approach to the piano was decisive yet never overpowering. More important, George clearly “felt” the message behind the music; he nodded to the melody even during orchestra-only passages. In the second half, the orchestra turned to Ludwig van Beethoven’s “Symphony No. 1” (part of ProMusica’s recently launched “Beethoven Cycle”). Danzmayr supplied vigorous leadership, and the musicians responded beautifully, offering a satisfying, almost-electric interpretation of this most propulsive of masterworks.